A U.S. military ship fired at a small boat in the Persian Gulf after it ignored repeated warnings to stop, killing one person. A U.S. military supply ship fired Monday at what appeared to be a 30-foot sport fishing boat in the Persian Gulf after it ignored repeated warnings to stop, killing one person on board and wounding three, Defense Department officials said. The USNS Rappahannock, a fuel resupply ship, fired on what two U.S. officials called a "small, white pleasure craft" 10 miles (16 kilometers) from the Dubai port of Jebel Ali. The dead and wounded were Indian fishermen, reported The United Arab Emirates' news agency WAM. The small boat appeared to be headed for that port, the officials said, adding that their information was preliminary. The U.S. ship verbally warned the smaller boat when it was 1,200 yards (1,100 meters) away and fired at least one warning shot before the decision was made to fire shots to disable the boat, the officials said. "In accordance with Navy force protection procedures, the sailors on the USNS Rappahannock ... used a series of non-lethal, preplanned responses to warn the vessel before resorting to lethal force," the Navy said in a statement. "The U.S. crew repeatedly attempted to warn the vessel's operators to turn away from their deliberate approach. When those efforts failed to deter the approaching vessel, the security team on the Rappahannock fired rounds from a .50-caliber machine gun." Officials described the course of events as standard procedures when a small boat gets too close to a U.S. Navy ship. The officials, who spoke on condition of anonymity, also described the small boat as having made a series of maneuvers, but were waiting for more details to clarify the situation. The Associated Press reported from Dubai that the smaller boat could have been mistaken for a threat in the gulf waters off Dubai, which are not far from Iran’s maritime boundaries. The larger vessel’s response also appeared to reflect heightened awareness of the potential threat of small powerboats piloted by suicide attackers, such as the one that blew a 40-foot hole in the side of the Navy destroyer Cole in October 2000 while it was refueling in the Yemeni port of Aden, killing 17 sailors, according to The New York Times. 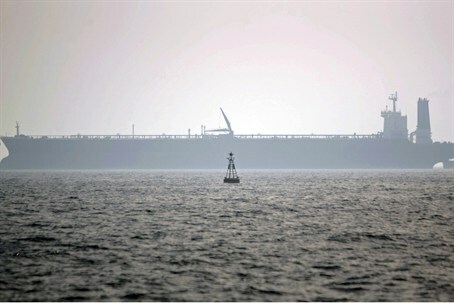 The news of the shooting, along with recent reports that Iran planned to increase its military presence around the Strait of Hormuz lifted international oil benchmark prices by as much as $2 a barrel on Monday.